If you are looking for a nice bathtub that is neither too fancy nor weirdly shaped, American Standard Cambridge is a great option for you to try out. This 5 foot bathtub features a classic design and is made from Americast material, exclusively available from American Standard. This makes the tub 50% lighter and more durable are compared to a traditional cast iron tub. Moreover, it also costs a lot lesser to install an Americast tub as compared to a cast iron one. This material also makes it easier for the manufacturers to make bathtubs that are deeper, flatter and more spacious, allowing you to enjoy longer baths. It also comes with a porcelain finish which makes the tub scratch resistant. Anti-slip matting is also added to the bottom of this bathtub to avoid slipping. In addition to this, the style which is gently curvy, featuring a supportive contour and a beveled headrest, offers both chicness and comfort at the same time. The American Standard Cambridge is available in a few different variations of white for you to choose from, and is definitely a great fit for most bathroom layouts. Freestanding tubs are a great way to incorporate a bit of style into your bathroom. 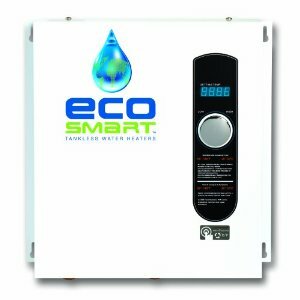 The best thing about these tubs is that you do not require them in a standard size or design, since they will fit wherever you need them to be. Hence, this offers an opportunity for you to experiment a bit with what you can get. Woodbridge 67” Acrylic is a great fit for all those looking for a freestanding tub that not only makes your bathroom look classy but also fits your price range. This tub is made from an acrylic material which is more affordable in the market, without compromising the quality. It has a double walled designed made from two layers of acrylic to ensure maximum insulation. Moreover, it uses full fiberglass construction along with an acrylic topcoat to ensure that your bathtub is both durable and shiny at all times. It has the capacity of holding 60 gallons of water and 67 inches of length. Woodbridge ensures that its bathtub has a comfortable design. Hence, the tub is both wide and deep, making sure that you are able to soak in a calm, leisurely bath. Another plus point of this incredible bathtub is its hidden, adjustable legs which allow you to level it out on an uneven bathroom floor. 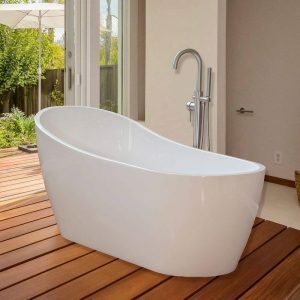 It is definitely a great freestanding bathtub for you to add to your bathroom. AKDY F210 is another freestanding bathtub for you to look at. It has a double wall construction which allows it to retain the heat inside the tub, allowing you to enjoy hot baths for a longer time. Its contoured design also makes it a lot more comfortable by allowing you the recline you want in the bath. It is a large bath, which has the capacity for 79 gallons of water and is great for family bath time routines. AKDY F210 also has adjustable feet which make it easier to install in uneven bathroom floors. This beautiful bathtub has a pearl white acrylic finish, which makes it a great fit for modern bathrooms, and its freestanding design offers you the option of placing it wherever you want. If you are someone who is interested in a more luxurious bathtub design or perhaps want your bathroom to look like it is from somewhere in 18thcentury France, you must have a look at the Drummonds Cooper Tay Bath. It definitely looks like something that a royalty would bath in. 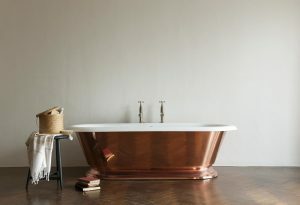 Made from sheets of pure copper, which have been hand-pressed onto the raw cast iron, the bathtub comes with the look of a traditional copper bath, but features the durability of a cast iron one. Apart from looking and feeling royal in this copper bath, you can also be certain that it will retain heat for a much longer time as copper is a conductor, and will allow you to enjoy your bath time for a lot longer. In addition to this, you will find that it is also corrosion-resistant a well as naturally antimicrobial. This bathtub features a freestanding design with a large double-ended roll top. The Studio 60 x 32 Inch bathtub with Apron definitely screams modern minimalism. 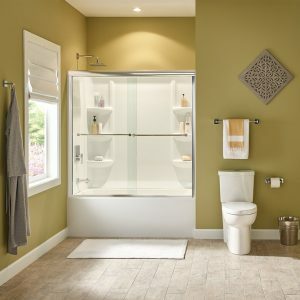 Its clean design, featuring sleek lines and a large and deep space for bathing is a great fit for many bathroom styles. You can easily fit it into a standard alcove or a normal sized bathroom. It also comes with integral lumbar support to ensure extra comfort for you and has a textured floor to prevent slipping. The bathtub not only looks incredible, but is also durable. Its high-gloss acrylic with fiberglass reinforcement ensures that it will last you for a long while. You can even match it with the complete Studio Bathtub Wall Set, which is sold separately. You can even add in a shower to add to its utility from an incredible variety of the best shower heads under $100 available in the market. 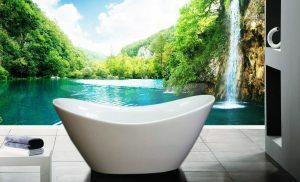 Therefore, if you are on the hunt for the perfect bathtub, and are confused about the aesthetic you want to follow in your bathroom. Have a look at the few options mentioned above and try to discover which bathing experience is the right fit for you. Remember, your bathroom is an important room of your house, any addition you make to it must be worthwhile and well-thought out.